Considered the most important prayer in Judaism, the Shema is both an affirmation of faith and a declaration of belief in one G-d. 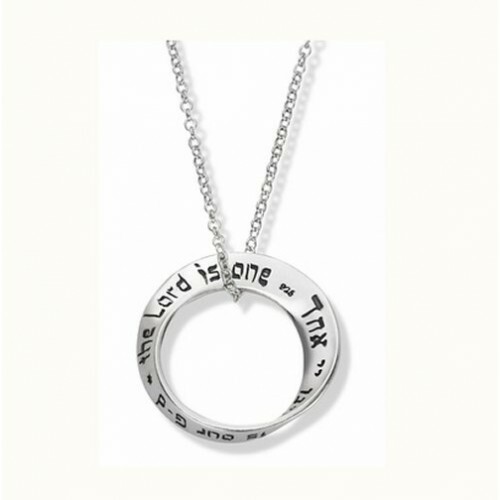 The first line of this prayer has been elegantly engraved in English and Hebrew on our mobius necklace. Hear Israel, the Lord is our G-d the Lord is one. Pendant measures .75" and is handsomely gift boxed. A beautiful jewelry keepsake, on 18" silver chain with circle clasp. The Mobius strip shape is a one-sided, one-edged surface, allowing the prayer to cover it continuously. Made in USA. Includes 18" chain, beautiful blue gift box and info card.